Use the Survey Integration feature to help monitor the level of service and requester satisfaction for the work your team provides. Administrators can schedule a survey email to be sent to IT requesters when their incidents have been marked Complete or Closed. Create a survey using a free 3rd party survey solution, such as Survey Monkey or Survey Gizmo, and include the survey link in an automated email to your requesters at your chosen frequency. Click on the Account Setup tab and then click Setup Requester Survey. 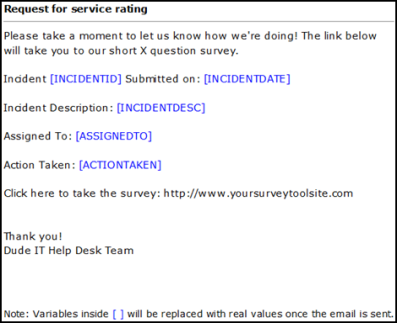 Select the Frequency of the survey by entering the percentage of incidents that will trigger the survey email. For example, if you enter 100, then every single request will send a survey email to the requester. If you enter 25, then only one out of every four requests will send the survey email out. Select the Status that will trigger the survey email - only when marked Complete, only when marked Closed, or when the request is marked either Complete OR Closed. 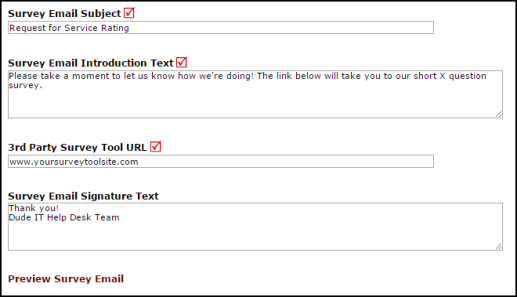 Type the desired Subject Line for the survey email your requesters will receive in the Survey Email Subject field. In the Survey Email Introduction Text field, enter instructions or information about the survey that will appear in the body of your email. Enter the link for your survey in the 3rd Party Survey Tool URL field. In the Survey Email Signature field, enter a closing paragraph and/or signature to the end of the email that will be sent. Click the Preview Survey Email link to view a copy of the email. When you are satisfied with the survey email you have created, select Yes to make the Survey Active. Once the survey is active and has been sent out to requesters, you can click on the Survey Email Log to view the survey emails that have been sent. *Note: Survey results can only be accessed through your 3rd party survey tool and not directly through Incident.